Happy Memorial Day weekend my friends! A “Quick and Easy Asparagus Soup” recipe to use up the abundance of asparagus from my CSA this week. This recipe is pretty basic, but could be jazzed up with sautéed mushrooms, bits of ham or bacon or some Parmesan crisps. 1. In a medium-sized soup pot, melt the canola spread and add the onion and garlic. Saute until onion is tender about 5 minutes. Stirring occasionally. 2. Add white wine and cook until mostly evaporated. 3. Add chopped asparagus and the chicken broth. Season with salt (and pepper if you’re a fan) and bring to a simmer. 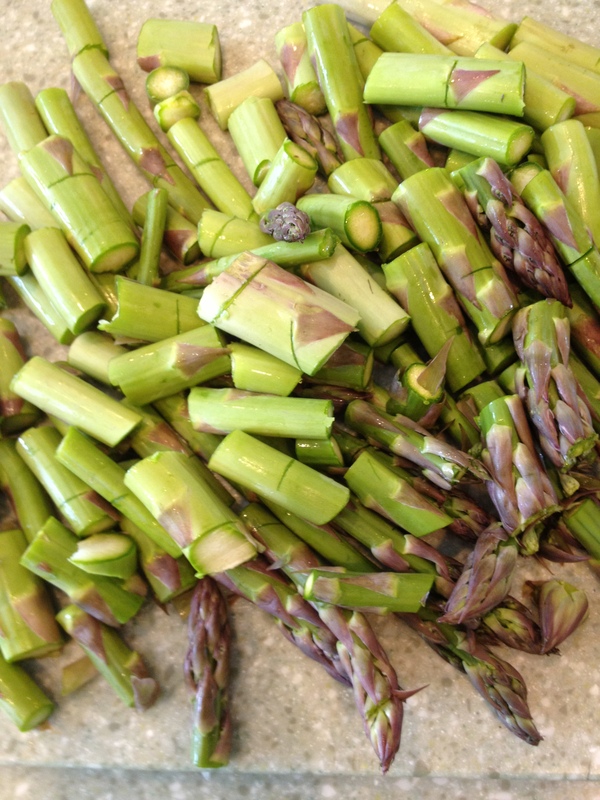 Reduce heat and cook for about 20 minutes or until asparagus is tender. 5. Using an immersion blender, puree until desired thickness. I tend to like mine not completely liquefied. You can also wait until the soup is cooled a bit and process in your regular blender. Posted in Soups and Stews, Veggies and tagged Asparagus, asparagus soup, Broth, Cook, Fruit and Vegetable, Home, Immersion blender, White wine. Bookmark the permalink. Proud stay-at-home mama of 4 who is passionate about feeding those she loves!